Children in TV ads – cute or insolent? Today most ads for products – from cars to mutual funds – feature kids. According to advertisers, kids are the biggest source of ‘pester power’ and so have a direct bearing on the purchasing pattern of a family. And with kids becoming smarter and more aware of things around them, this is a very sound strategy – for the advertisers, that is! How the children are affected in this process merits a separate post in itself. Issues like the undue exploitation of child actors, the psychological effects of being in the limelight and going through the grind are all pushed to under the carpet. It is the ads themselves that I am talking about here. These are undergoing a sea-change. Earlier, the kids who featured in the ads were cute, child-like and behaved like children their age. But kids in today’s ads are increasingly made to act bratty, insolent and sometimes insufferable. What surprises me is that no one seems to have any objections to it! The other day I saw this ad on KBC on the TV. It shows a classroom and a teacher asking a question. It goes something like: ‘Who said, you give me your blood and I will give you freedom?’ One boy jumps up and says, ‘You said it just now, sir!’ The whole class laughs. The kids then give the same reply to another teacher while jumping and giving each other high fives for their smartness, over his head! Some other kids heckle an old man in their colony for protesting against their throwing a ball into his home. Finally Big B asks the same question to the contestant in the hot seat and the ad ends. As concepts go, it might be a good ad, but using kids in that fashion is what I find unacceptable. There is another ad in which a father brings a piggy bank for his son on his birthday. And the boy says, ‘If you had to give me something for saving, at least you could have given me SIP,’ a savings scheme of Tata Mutual Funds. When the father expresses his ignorance about it, all the kids heckle him saying, ‘Don’t you know SIP?’ as if they are talking to the world’s biggest moron. A child’s voice over then lists the pluses of the said saving option! The adman perhaps wanted you to understand that it is so simple that even a child can understand it. There must be many more such ads, but these two came to mind immediately. There have been other ads that have shown children who are smart vis-a-vis elders, but somehow the way this ad is made did not seem right. Agreed that children know a good sight more than their elders sometimes, but please show some plain-old-good manners, if not respect to the elders in the ads! Now, I agree that kids these days are very smart, aware and intelligent. But isn’t it carrying things too far to show them putting down adults and ‘advising’ them on – of all things – mutual funds? More importantly, does being intelligent give them the liberty to be insolent and rude? Sadly we see more and more children becoming this way even in real life. But when an ad carries such images, it reinforces such behaviour, doesn’t it? Whatever happened to old fashioned values like respect, humility and innocence? I will digress a little here: While in the UK I saw this cartoon, ‘Peppa Pig,’ which is about this little pig called Peppa and her younger brother George. There are also Mummy and Daddy Pigs to complete the family. 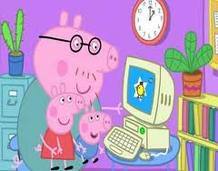 Now, in this hugely popular series the daddy pig is shown as making stupid mistakes and the kid pigs calling him, ‘Silly Daddy’, and laughing at him. The sheepish daddy then admits to his mistake and corrects them. I found this rather offensive, but going by the popularity of the series – the markets are flooded with Peppa Pig kid’s merchandise – one wonders if a whole generation is growing up to think that it is fine to tell one’s father that he is silly! Perhaps the liberal parents of today might find it offensive that I am even pointing this out instead of appreciating the intelligence of the kids! That was about a cartoon but our ads are fast catching up in this department. It is fashionable nowadays to ask, ‘Why should we respect someone because he or she is old?’ I have heard parents say with pride that their children can be ‘blunt and point out to the ignorance of an adult.’ As if it were a great thing for children to be impertinent! The least they can teach the kids is to be polite while doing it. There is nothing wrong in learning things from a child if he or she knows more than you, but to let the child think it is ‘smart’ to be impolite, is surely bad. Children give lip to the elders in their family and often get away with it, partly because their parents themselves treat the older members with scant regard. Cases like these are not the norm in all families and so can be ignored. But when such sentiments invade our living rooms in the form of ads, it is cause for concern. The media has such potent power at its disposal that it doesn’t realise the havoc it is creating in every sphere – news, movies, ads, you name it and they are there with their devastating inputs. The latest is the assault on kids and their psyches. Can you imagine the havoc it would create if this generation for whom TV is God, begins aping its ad counterparts? I think the bodies regulating ads are only worried about false and misleading claims made by manufacturers in their ads and not about such insidious corrupting of a child’s mind. You ask – whatever happened to the simple, good values like respect, humility and innocence? Well, I say – in all this business of having too much informal yarana-dostana with kids, every such value is out the window! And it is all merry-go-lucky-we-are-all-equal-equal type of stuff now. I don’t watch any advts now, so don’t know what is all there. But I agree that in some way they really do reflect a certain kind of value that is subtly or not-so-subtly being sold to impressionable minds. The whole consumerist culture is a visible proof of the effectiveness of messaging of the advertisements. That’s why it is all the more important what messages are given to the children. Totally agree about treating children like adults and ‘friends’ rather than treating children as such. Even that is fine, so long as this starts when the children are a little older, say in their teens and even then treated only as old as they are. Investing them with too much responsibility and maturity beyond their years can actually harm the children. But who cares? It is all about aping the latest parenting manuals and western models as in everything else. I agree that consumerist culture lies at the root of the malaise. Again, who is bothered? When parents consider their children ‘smart’ for being rude to elders, there is nothing more to say. And the advertisers will surely work on it to push up their sales. You touched the paining nerve Zephyr. My major concern these days- My 2 year old try to lip sing/recite the songs by Honey Singh and you know what I am trying to point out here. I need to divert him whenever those censored words come. I do not watch TV myself and therefore do not know about such ads. I do not allow my Son to sit in front of TV due to the same reasons-too much of information and in-compassion. I too believe these ads should follow the plain-manners instead of elder mocking. Though he watch youtube videos but that is limited to abc, numbers, dough playing and poems. Ahhh! No idea where the world is going. If this post touched a nerve, the next one might set it ringing 😀 Do read the next post on information overload. You are sensible in limiting TV time but as he grows older, you might find it harder to control it. The very fact that you are sensitive to the contents being shown and are aware of their ill effects is the first step in controlling it. Yes, it makes me worrisome to think that I could not control much things later.I hope I can help him understand what to absorb and what not. You will do fine. There is not much you can do to completely insulate the child from such influences but you can take precautions. For money and popularity people are attracted towards media, can’t blame only kid’s even parents take wrong decision and spoil the future of the kids. We all watch so many reality shows where small children perform dance or participate in singing competitions but after the program ends what will be their future, organizers and parents should think about it. Very true, Suman. I have a half written post on reality shows. Your concerns are shared by many parents including me! Praising children disproportionately is actually causing more harm than good. Do read the next post. I have dealt with more such concerns. I don’t think children in ads is so much the problem as children in reality shows (especially the dancing ones). It is mortifying (and frankly a little scary) to see kids aged 4-5 onwards imitate suggestive gestures popularized in movies..
I’m not sure kids ARE brighter nowadays. They’re more aware about what Big Biz wants them to be aware of, but in terms of morality, history, common sense even, it has been left behind. Which is, I think, the point. Indoctrination is the device of any single-issue society, and best to get them young. So kids are becoming bright consumers, and given importance, hence their use in ads – with adults suitably shown as not so bright. I believe that awareness brings in a measure of intelligence, but not in the way it should be put to use maybe. Like you say, they have no grounding in the real values of life. But isn’t it telling on our own part in the whole affair when we are not even protesting against these, just as protests are registered against misleading claims in ads. I agree with grond on the fact that parents are largely to blame… The kids don’t understand all these reality shows and comedy shows… Its the parents who in an attempt to achieve the quintessential middle class dream of recognition on a public stage and having passed their age goad their poor kids into it… Of course equally to blame are parents who give in to their kids’ tantrums… The kids quickly realise that tantrums can get them stuff and exploit it to the max… One reason my sister and i never tried this was because we knew that all the tantrums would earn us was a whack across the face! Long time back, there was an ad of a mosquito repellent where, the father jumps like a frog after losing a bet with his child on the efficacy of the product. I remember me and my children (who were themselves children at that time) finding the ad in cheap taste. Ads also have a social obligation. Although I admired AB’s acting in Nishabd, I still condemn the movie as it condones and indirectly supports such behaviour. The other day when me and my MIL told my son to watch a TV dance show of children, he refused and accused such shows and their viewers of supporting exploitation of children and their innocence. Honestly, at that time I thought he was not appreciating those cute children’s talent. He was equally against ads showing arrogance and disrespect to elders. Today, I feel you and me dont stand alone in getting disturbed by such ads. The likes of Grondmaster and Siddharth are supporting us. Our admen and TV producers need a primer on the basics of good and wholesome viewing. There is no censorship and parents are equally lax too giving their kids more freedom than they can handle. Reality shows are the pits and I don;t watch them at all, despite some of the performers being excellent. The dance shows are lewd and bawdy. But the ads are what make it worse. They come in all channels and are repeated over and over to imprint themselves on the minds of children. To be honest, i never thought about the subject in this way. And now that you have put it forward, it sounds very reasonable to stop using kids in this way! Great post, an eye opener! You must be one of those who don’t watch such programmes then! This requires a mass movement to be stopped or at least restricted! These days, everytime I see a TV show, especially the comedy shows, with kids on stage, I immediately change channels. The comedy shows have jokes which are largely below the belt or have enough sexual undertones to make a sailor cringe. Some of these have child actors doing these skits. I wonder, does the kid even have any idea what exactly is she being told to mouth as dialogues? If not, is she getting ideas of how she will behave when she grows older? The parents need to be slapped here. In today’s crass commercialization, they have sacrificed their children’s innocence on the altar of fame and money. Granted, these shows bring in money, but there has to be a limit to what the kids can be put up to. They are extremely talented, no doubt. So hone their talents, don’t exploit them. Another aspect that I wish to speak to here is also related to kids’ talent shows. Some kids are, as I said, extremely talented. Each episode the judges and the audience praise each performance of these children to high heavens. A child is not as inured to disappointment as an adult is. Anyone has any idea what a rejected contestant goes through? Behind the tears and plays brought about to increase TRPs, is a child, with an innocent heart, one easily broken. All said and done, what are we doing in our race towards crass commercialization? Ruining the lives of innocent children, that’s for sure. Things to think about? Hell yeah! Hey Grond, you are very right about all the shows and serials exploiting child power to mouth profanities and rude words. Why don’t you do a guest post for me if you have the time, on this topic? I don’t watch serials and talent shows because of the very same reasons you have listed, so can’t do a comprehensive post. You express your views succinctly and it would be great to feature them here. Give it a thought! anyhow i just hope kids don’t read too much into these ads..
psst pssst psst: can u whack vinni for me? Why don’t you start an email subscription? I am not savvy about reader and stuff. I see a new post in the mailbox and hop right over to see it! SIP is small investment plan or something to that effect! Hey thanks for the correction! i know there are couple of parents who might stop such behavior in kids.. but progressively i see parents wanting to spare the rod and kids speaking big words like “corporal punishment is crime” and so on.. trust me i have heard it from a 8 yr old… 😐 when i have kids, let him mollycoddle them with love, i ll be the one who wields the rod! 😀 shouldn’t someone warn Vinni about his impending whacking? Shsh…..someone from the Child Rights dept might start keeping tabs on you! Now who is this Peters guy? Did he survive to tell the tale? ← Look who’s talking about saving the environment!